There are mushrooms and then there are morels. There are mushrooms and then there are morels. Chefs and foragers who can’t get enough of their sweet, nutty umami-packed flavor covet the conical, honeycomb-textured fungi. They’re around for only a short time, so here’s a short guide to getting the most from morel season. Where: Morels like moist soil, warm temperatures and dead or dying trees (the decay is a great food source for the fungi). They can be found in most regions in the US, save for the deserts. 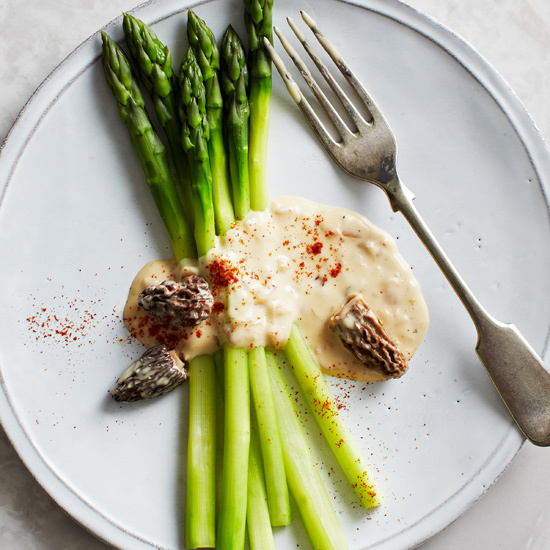 What to look for: Choose firm, springy morels with a deep, earthy aroma. Discard any that are moldy, dried out or too soft. Do not attempt to forage for morels if you are not an experienced mushroomer, as there are multiple varieties of “false” morels that can be toxic. Instead, purchase them from the farmers’ market or buddy up with a knowledgeable forager. Flavor profile: Like truffles and other wild fungi, morels have a unique depth of flavor. They are nutty, meaty and deliciously complex. Healthy benefits: Morels are low in calories and high in vitamin D and B. How to eat them: One of the best ways to prepare morels is simply to sauté them in lots of butter with a sprinkling of salt and pepper. They are also delicious roasted with Cornish hens, tossed with a springy pasta or stirred into creamy risotto. For an ultra-indulgent brunch, try infusing them into a hollandaise sauce to serve over poached eggs or simply blanched asparagus.